You'll be £19.99 closer to your next £10.00 credit when you purchase The Nazis' Nuremberg Rallies. What's this? Order within the next 10 hours, 20 minutes to get your order processed the next working day! Each September from 1933 to 1938, the Nazi Party held spectacular rallies at Nuremberg. These Reichsparteitage (National Party Days) were vast and meticulously staged managed extravaganzas in which ritual and ceremony played an important part. The Rallies had two key objectives. The first was to focus public attention on the success and power of the Nazi Party and so connect with the public conscience and build a close bond between Party and people. Secondly, and perhaps even more important, they served as a vehicle for presenting Adolf Hitler as the saviour and undisputed leader of the German nation. The Hitler Cult was blatantly promoted with revolutionary use of propaganda by the latest technology and iron control of the media. Every opportunity was taken to celebrate the Fuhrer's achievement of restoring national pride, power and prosperity after the shame and economic disaster of the post war years and the deeply resented Versailles Treaty. The author's superb collection of contemporary postcards and images and his well-informed commentary takes the reader on a visual journey through each year's Reichsparteitage. The Nazis' Nuremberg Rallies, which also includes character studies of the principal Nazi figures, is a fascinating way to gain a full understanding of this uniquely successful Nazi ritual. Packed with pictures showing thousands of Nazis, young and old, honouring Hitler as the saviour of Germany. 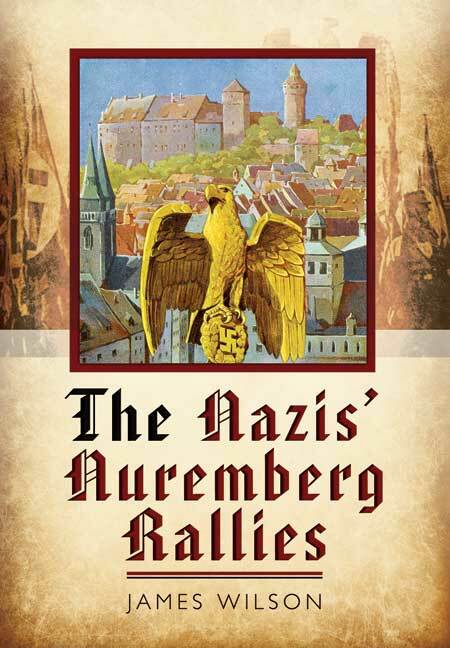 The Nazis’ Nuremberg Rallies represents a landmark in historical works specializing in the Third Reich period. James Wilson’s extensive use of 1930s postcards is a brilliant way of portraying one of the most significant epochs of the 20th century. We are well familiar with the ongoing abundance of books relating the horrors of WWII and the Holocaust. However, this attractively different composition reveals a fascinating perspective by exploring the Germans’ initial troubles and despair following the First World War and their subsequent hopes and aspirations under the National Socialists’ regime. Wilson paints a vivid picture of the ‘Führer’ and the Hitler cult that the Nazi propaganda machine was so adept at creating. He also introduced us to the words of the Führer addressing the German people and to the mass-media events that were previously unthinkable. Through the combination of vivid contemporary photography and the author’s well-researched introduction and commentary, the reader gains insight into one of the most impressive recurring mass gatherings in the world; the annual Nuremberg Party Rallies. Hitler’s choice and promotion of Nuremberg as the ‘most German of German cities’ and ‘ideological capital of the Reich’ resides in his underlining the continuity from the medieval First Reich (Holy Roman Empire of the German Nation) to his own Third Reich. This work also gives us a few clues in helping to answer the ever-puzzling question of how a family-orientated, peace-loving and educated Christian society becomes mesmerized to a point of carrying out - or at least condoning - barbaric acts of violence against humanity. Wilson’s well-constructed presentation of the greatest propaganda events of all time will surely become a reference work for history buffs and historians alike. With his wife, Christine, David Harper has been operating history-focused tours of Hitler’s Eagle’s Nest compound in Berchtesgaden since the 1980s. He is also a tour operator and guide for WWII sites throughout Europe, including the Nuremberg Party Rally grounds. Author of a guide book on Berchtesgaden’s history and sights, David Harper has also been interviewed in a number of British and American WWII and Eagle’s Nest related documentaries and printed articles. The selection of postcards featured is certainly impressive and provides a fascinating insight into the years before the Second World War in Germany. The hardback is impressive in its scope, production and presentation. If you need an example of the wide range of titles published by Pen & Sword you have to look no further than this curio by James Wilson. What we have is an amazing collection of original photographs and postcards releating to the Nuremberg rallies of the Nazis. I am bound to say that the book is dazzling, because collating all this stuff is a work of skill in itself. Top Marks.